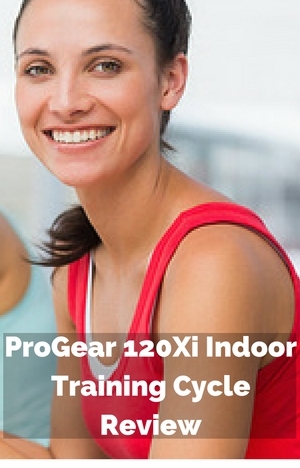 The ProGear 120Xi Indoor Training Cycle is an affordable priced bike. Designed so you can get a cardio workout like you’d get on an outdoor bike. It has a basic design like many spin bike/indoor cycle. So you can just focus on your workouts and there is less to go wrong too. It has a number of good features like the 35 lbs flywheel, 3 piece crank, continuous resistance friction, adjustable seat and handlebars. So there is definitely some good stuff to commend it. But there are some things, to help with the affordable price, you might want to think about before buying the bike and putting it to the test. In my review I go through all this in detail so you get the full picture of what to expect from the bike as you use if for your low impact cardio workout. First to check out is how stable the bike is as you workout. It has a steel frame and stabilizer bars to hold you steady when you transition back and forth between standing and sitting as well as when you are pushing yourself hard sitting or standing on the pedals. You’ll feel safe without any feeling like you’ll tip off. You might notice some minor movement but not enough to distract you from the workout at hand. If the bike is rocking slightly you can turn the end caps on the back stabilizer bar as they work as levelers. It will balance up the bike for any slight variations only. You can also put the bike on rubber exercise mat to stop the rocking. The bike comes with a 2 year warranty and 90 days on parts. As to durability there is little to go on, but other bikes from ProGear on the whole seem to last well and this one looks to have been constructed to keep taking the punishment of workouts for years. The bike is recommended to fit people between the heights of 5 ft 1 and 6 ft 5 ins. Making the adjustments to the bike is quick and easy to do so it can be used by multiple people to get their workouts. The seat can be moved vertically and horizontally to get the proper leg positioning for proper range of motion giving an effective workout. The handlebars has 3 vertical positions. To make the adjustments there are adjustment knobs with pop-pins that you loosen and pull to disengage the pin so you can slide the seat or handlebars to the position you want for your workout. You then re-insert the pin into the closest pre-set holes and then tighten up. This should stop and shaking. Inserting in pre-set holes may mean you have to move the seat and handlebars slightly from where you’d like it but having a pin inserted in a hole does provide some safety that the poles won’t slip suddenly downwards while you’re on it. The first time you do it may take a little time to get it in the best position but after that its quick and you can mark the poles to make it quicker to set if someone has moved it. You might find you don’t quite get the fitting for your body just right as you can’t move the handlebars horizontally leaving you either a little cramped or stretched. For most people it should be fine. The 35 lbs flywheel provides the momentum to pull the pedals through the whole 360 degree pedal motion for a more fluid and smooth pedal motion. It helps to prevent the feeling of the wheel pulsing as you apply higher amounts of tension. It has a fixed gear so freewheeling or coasting is not possible – when the wheel is turning so are the pedals. To stop the pedals turning, so you can get off or rest you need to do this gradually or if you want to stop quickly you can push down on the lever next to the knob to use the resistance pads as a brake. If you do this with your legs it can cause stress and result injury. The pedals are attached to a 3 piece crank which gives you a good solid base for standing and pushing against the resistance. It has dual pedals where one side that toe cages and straps and the other is a pedal. Both sides are for use with athletic shoes. With the toe gages you can use the strap to size them to your foot so you can get the best foot position for grip and pushing the pedal round the stroke for an effective and effective workout in and out of the saddle (seat). If you’re not used riding a bike you are likely to feel it on the sit bones and it will take some time to get used to it provided it has been properly adjusted when assembled. But, again for some this won’t be the answer and it that is you, you can try padded bike shorts or a gel seat cover. Or you can replace the seat with one that is more to your liking as it will fit a standard fitting seat. Handlebars. The design of the handlebars caters for the standard spin bike grips with the bullhorn and central loop for when you’re in and out of the seat. It is covered in a soft foam for a comfortable non-slip grip. It good for grip but won’t provide enough padding if you want to lean on them for long periods. Noise. It’s not a completely quiet bike with a couple of people in their review talking about the noise, but it should be quieter than they suggest. It seems to me they might not have the bike properly balanced by using the levelers and that the chain may not have been properly tensioned. Cleaning. Sweat from people using the bike is likely to be the biggest source of any cleaning that needs to be done. If left on the bike it can start corroding and damaging it. It is best if it is wiped from the bike after each use. Sweat can also drop on the floor and may damage that too – putting the bike on a rubber exercise mat will protect the floor. There might notice some dust from the resistance pad as wears down too. The bike needs an area of 20 by 47 ins when not in use so probably too big for a closet. There isn’t a strap or anything to prevent the flywheel or pedals from being turned but you can turn the resistance up to stop this happening to prevent injuries especially if you have little children. To help with moving there are 2 transport wheels on the front stabilizer bar. You tip the bike on to the front wheels which one person can do and wheel the bike where you want. Most of the weight is at the front which helps in the tipping up and also helps in keeping it balanced as you move it round. One person can do this on their own. The only surface you may have difficulty on is deep carpet where the wheels may get stuck. However, if you have a wood floor you may want to check that the wheels don’t dent or scratch the floor before moving it all the way across the floor. The bike is delivered part-completed leaving you to finish it off. Fortunately it is straightforward and can be done in an hour or two. The most difficult part of the assembly has been done. Although if you look at the overview drawing you’d think otherwise. It is there to number the parts not to show you what’s needed for assembly. It can be ignored. You don’t need any of your own tools as the ones needed for the job are included. The instructions and diagrams for the assembly are clear. You are required to add the stabilizer bars, handlebar, seat, posts, water bottle holder and pedals to the frame and drive assembly. It’s easier then kitset furniture. The biggest issue is likely be the weight with the box weighing just under 100 lbs. So you may want a 2nd person to help you with moving, unpacking and holding the pieces in place while you attach them to the bike. But it is possible for one person to do it on their own. The bike doesn’t come with a console for tracking and monitoring your workouts. There isn’t one designed for the bike that you can buy separately. It is possible to add a bike computer to it, such as those made by Cateye if you like to see how you are getting on. It does need the spoke magnet to be altered and some other DIY work to get it to fit. Although no-one has done this with this bike there are videos online where people have done it successfully on other similar bikes. It only comes with a water bottle holder as extra. It is wire holder that is on the frame. It puts the bottle in easy reach when you want a drink. You might find it gets a little wet from drips of sweat. Also, you need to be careful not to give it a kick as you get on and off the bike if you want to step over the bike. There is some help with warm up stretches in the owner’s manual but there isn’t any help with regards to workouts and how to properly fit the bike to you for the most effective workouts. For a bike that is good for beginners like this I’d have expected a little more help. Fortunately there is plenty of YouTube videos to help in setting up these bikes and workouts to get you started if you don’t want to get a DVD. There are just a few reviews on this bike and they are favorable to date. ProGear exercise bikes overall are liked by customers with them saying they get good value for money but these are for folding bikes. From these the bike is fairly well rated although there is some concern about noise but for the price they think they got a good deal overall. When there are more reviews online I will update this section. For the price you get a basic bike without any frills except for a water bottle holder. Included in the price is a 35 lb flywheel which for a smooth and low impact pedaling motion. It does at present with pricing below $200 seem a good deal. This is a good basic bike for beginners and those who want a cardio workout that is tougher than you get on other regular exercise bikes. I don’t like the caliper style resistance as I believe it tends to provide a less reliable experience than the direct method of applying resistance to the flywheel with friction pads. It will need more maintenance to keep it providing the consistent level of resistance you want. It is going to give a fairly smooth pedaling motion and steady workout. It will be able to stand up well to those who want a good workout but is probably not for those who want really tough high intensity workouts day in day out. This is a good bike for those who don’t want to spend a fortune to get a good cardio workout and who want up to moderately intense cardio workouts rather than those who are looking for very advanced tough workouts.